The idea is there. It might develop because of a conversation. That conversation reminds you of a lesson you taught, a workshop you participated in, or an article you read. The idea is the fibrous web that connects all of those things together. At this point, though, the web is only in your head. You're not sure where each of the strands will be, but you know they will be there. At this stage you have a constant nagging need to nurture it until it is fully formed. So, as the day goes on you take quick notes. Maybe they're on a notepad or on your phone. Each note is a strand of the idea web. You methodically record each note, starting to design the structure of the web. Once you have a basic outline that connects all of the pieces, you start to write. Those notes are now subheadings, and the details on each of those big ideas become paragraphs under the subheadings. Once it is done, you sit back and look at the web. You proofread and make little adjustments here and there to ensure there are no big holes. The mental effort it takes to come up with an idea, give it structure, and fill it in with evidence and opinion are quite different from the effort a spider puts into making a web. 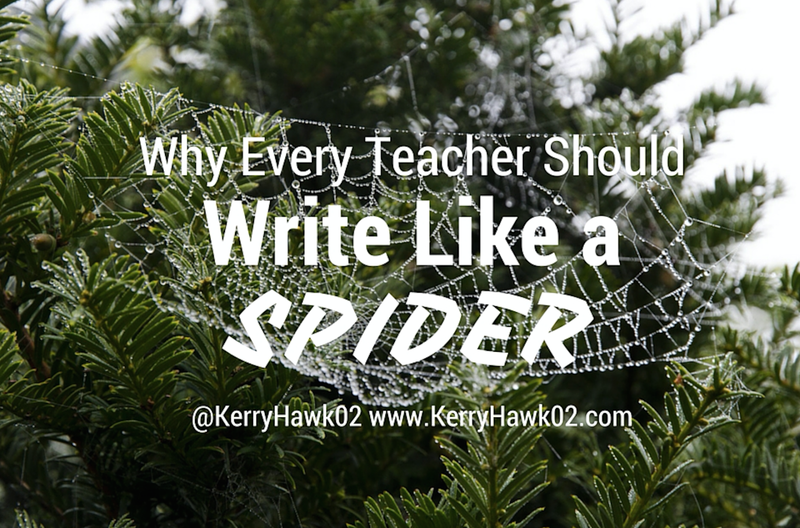 But, like the spider gains food from its web, writing seems to always give back. For a writer, though, it isn't about trapping insects. It's about brain food. When sharing that bit of writing with colleagues, educator friends on social media, and family, the result is feedback. Sometimes they agree and add evidence or enthusiasm to the idea. Other times they disagree and challenge the thinking. Either way, the conversations that result from the writing will feed your brain and keep you coming up with more ideas. Click here to read the EdSurge piece. Different species of spiders create different types of webs. Really! There are orb webs, funnel webs, platform webs, and more. Similarly, writers are known for what they write. Recently I wrote a piece for EdSurge about how educators can build their brand. The article discussed how writing, and then sharing that writing, can lead to more professional connections and opportunities. Educators who write build a reputation for their patterns of thinking and ability to express themselves through their writing. I started my blog in 2009 to share the weekly writing I was doing as part of a graduate level cohort. Once the cohort ended, though, I found it hard to stop writing. (Remember those nagging ideas? Thankfully, they didn't go away!) My blog evolved as my career did. It became more about student-centered lessons and thoughtful use of technology in the classroom. Lucky for me, a few online EdTech publications - at first it was EdSurge and Smarter Schools Project - noticed. Now I get to write and share my ideas more broadly. It's like making that spider web ten times bigger and catching ten times as many insects. Yum! I get even more feedback from other passionate educators and professionals. Think of all that brainfood! My teaching, learning, and writing has improved, all because I started writing about my classroom 6 years ago. Every educator can feel this energy. Start by writing like a spider.